The lines are gone, the players are headed home — or to Jupiter, or to rehab, etc. — and Winter Warm-Up at the Hyatt Regency in St. Louis has come to a close. I haven’t heard of a better way across all of MLB to ramp up excitement for a club’s pending season than the three-day charity event put on by Cardinals’ Care. From player access to Cardinals’-themed memorabilia shows — including booths by Stan The Man, Inc., Whitey Herzog, and Tony LaRussa’s ARF organization — the annual Redbirds celebration leaves fans chomping at the bit for spring training. During my two-day attendance this year (Saturday and Sunday), I did my best to toss out stories and quick news bursts to get the most interesting bits out to you in a timely manner without simply repeating what the legit media outlets are covering. 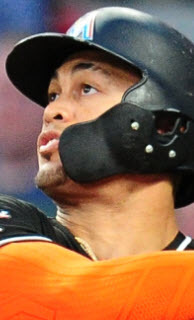 Over the next few months, a bit more will leak out here at Cards ‘N Stuff — pieces just too involved to work up in a matter of minutes between player interviews — but for now, here’s a few post-Warm-Up observations to chew on. Carlos Martinez wins the “Most Awkward Tag-Along” prize. During a previous player’s interview, a translator provided by Cardinals’ Care (who made it clear she was not the player’s “official” interpreter) translated questions and answers between media and the player. Martinez, however, despite the presence of the same translator, brought along a friend. 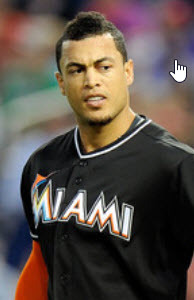 Alexy Hernandez identified himself later as Carlos’ Business Manager — although, outside of the already pre-arranged autograph ticket sales, I’m not sure what “business” Martinez would have to conduct at Winter Warm-Up. Alexy did fine, although his translations had the feel of a summary of his own interpretation rather than word-to-word representations, but the whole affair had the oily feel of the start of a posse. And it brought to mind the days of Albert Pujols’ “handlers.” It may all turn out fine (maybe he just wanted his friend to tag along and thought a title would help with access), but it reminds me that things seem to go smoothest between the Cardinals and a player when there are as few people involved as possible. Carlos has an agent. He should leave it at that. The Cardinals couldn’t ask for a better ambassador than Adam Wainwright. When Waino talks, people listen. He has a casual, confident, and commanding tone — unhurried and at the same time, imminent, like the gradual slide of a glacier down a mountain — and while the delivery is different, the leadership presence of Chris Carpenter remains in the form of a Georgia boy. 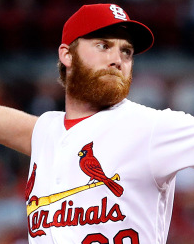 Wainwright is clearly in love with playing for the city of St. Louis. He has the look in his eye of someone who has come home and has no desire to ever leave. When he says he “bleeds Cardinal red,” he means it. It’s refreshing to be in the room with a player who doesn’t sound like he’s simply repeating the company line. Sure, he still could be, but I don’t think so. Let’s put it this way…either Adam Wainwright sincerely loves playing for the St. Louis Cardinals and coming to work in the city of St. Louis, or he’s the best con man in the modern game. Oscar Taveras is a young dude. With all of the speculation I read about Taveras, I went into his media session expecting a more stand-off’ish persona in dark sunglasses and maybe the start of a developing entourage, Carlos Martinez style. Instead, he came in alone, used the Cardinals’ Care translator when needed, and met several questions with a sheepish, embarrassed grin when he struggled to understand the language (he started out answering in English on his own but soon became overwhelmed and looked to his translator for help). 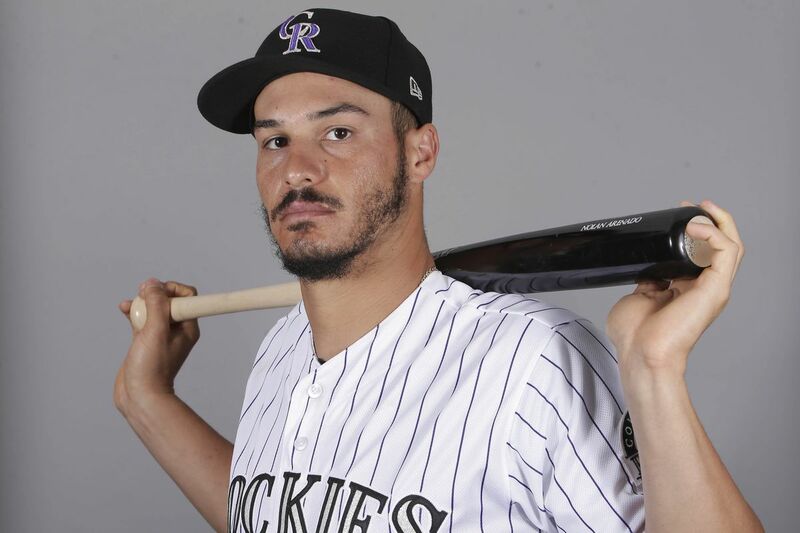 There was no outlandish hairstyle, no designer clothing (his jacket was from Aeropostale), no weight-room-worthy jewelry hanging around his neck, and his posture and smooth, young face suggested, “I’m just here to play baseball.” He was bigger, more “filled out” than last year, as if he just now started growing into his body and storied swing, but that grin and those eyes couldn’t lie. This kid is young…but he gets it. 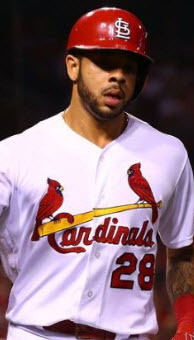 We’ve heard the Cardinals say more than once that Taveras’ personality struggles have nothing to do with arrogance or diva’esque behavior and everything to do with inexperience and youth. After talking with Oscar this weekend, I whole-heartedly believe it. The Young Guns are growing up. During last year’s podium time, several of the Cardinals’ young hurlers seemed to struggle a bit to keep up with their newfound celebrity and interest. Seth Maness, for example, rushed down the street to buy a “nice shirt” — he came back with a v-neck t-shirt, proud as can be. But this year, from Rosenthal to Maness to Carlos Martinez, these kids all looked like they belonged. Rosenthal, bulked up and sporting a Paul Walker-like hair style (the longer hair look, not the buzz), played the elder statesman, sharing the podium with Keith Butler and casually bantering back and forth with the media. Martinez, for all his style and flash, talked rotation competition rather than gaining experience and learning from the veterans. And Joe Kelly, the man who once thought he wasn’t yet recognizable enough to skirt the hotel lobby to avoid getting mobbed, handled question after question about deserving a chance to start the year as a member of the starting five like he was a 10-year vet. Watching these “kids” should be a lot of fun in 2014. 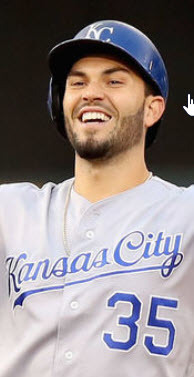 Or to put it another way, what do you get when you take a young, fireballing corp of pitchers with dazzling stuff, tremendous poise, and grueling postseason experience — and you take the “young” out of it? You get the St. Louis Cardinals’ pitching staff. The Cardinals feel the need for speed…and defense. When Mike Matheny reached out to Whitey Herzog as a new, young manager, I thought the effort was made more out of respect and an attempt to unify the various factions of the organization than it was anything else. Now, however, I have to wonder…are Matheny’s teams going to ultimately resemble the Whitey-ball teams of the 80’s more than they will the TLR teams of recent memory? Matt Carpenter, an on-base machine, moves to third base to optimize team on-base potential and defensive alignment at a position typically reserved for power hitters. Kolten Wong takes over at second base and brings with him a sparkling ability to both defend the bag and steal it. 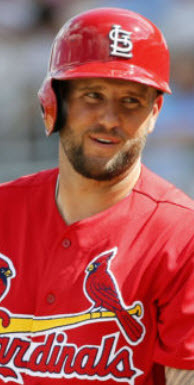 And Peter Bourjos joins the roster with a reputation as one of the game’s best defensive center fielders and one of the game’s most promising stolen base threats. Sure, Johnny Peralta is no Wizard at shortstop, but with the defense and speed surrounding him, he doesn’t have to be. And the presence of bats like Holliday, Craig, Molina, and Adams (and eventually Taveras) means the Tonly La Russa era left its mark as well. This team not only looks more like a Matheny team than a TLR team just three seasons removed from Tony’s rule — it actually is a Mike Matheny squad. By blending the speed and defense focus from the Whitey-ball era with the competitive edge and pop of a TLR-led team — not to mention a bit of advanced statistical methodologies — Matheny is already starting to carve out his own identity. Tony La Russa still captivates a room. Easily the best moment of Winter Warm-Up for me was when Tony sat in the media room and talked with the rest of us. He was casual, positive, and more than a bit nostalgic. 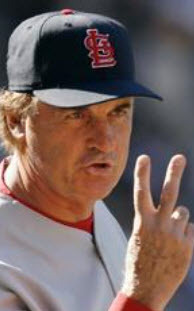 I’ll write up a more involved piece based on the La Russa session later this season. Derrick Goold is a media mastermind. Goold is the main man on the Cardinals’ beat for the St. Louis Post-Dispatch, and he’s one of the main reasons the PD is known for having some of the best baseball coverage in the country. Watching this guy work at Winter Warm-Up is absolutely astonishing. While most of us are struggling just to keep up with the rapid-fire media sessions from player-to-player and still make it look like we’re actually posting stories, Goold is uploading videos of interviews, posting pics, hosting live online baseball chats…and ALSO writing stories, transcribing notes, and finding time to conduct one-on-one interviews with key players and coaches. I wish everyone in Cardinal Nation could see firsthand everything Derrick Goold does to bring them all the coverage they covet. It’s a lot of work, it’s exhausting…but Derrick makes it look easy. I came, I read this article, I counreqed. Good thoughts Kevin. Looking forward to hearing more and especially looking forward to another banner year from the Redbirds.